On Aug. 2, after reading about “America Tropical,” the famous mural painted in Los Angeles by Mexican muralist David Alfaro Siqueiros, there I was, for the first time — inches from the huge masterwork. I received a call from Luis Garza, who sits on L.A.’s Siqueiros Mural, Events, and Marketing Committee overseeing the restoration of the mural. Garza invited me to the press conference where L.A. Mayor Antonio Villaraigosa would have exciting news regarding the mural. Villaraigosa’s spoke on Olvera Street, the city’s founding avenue and location of the Siqueiros mural. Before a large crowd of city officials, local business people, artists and reporters, the mayor announced the city’s collaboration with the Getty Foundation on finalizing conservation efforts and providing public access to the mural. At last, the day many of us had dreamed of for years had finally arrived. It was official: a budget for the project had been approved and the renowned mural would live again. In fact, the work may be more provocative today than when it was first painted. Rather than shying away from the artist’s political message to concentrate on his mural as purely an artistic triumph, we should celebrate and defend the anti-imperialist politics of “America Tropical.” I must applaud the mayor’s bold leadership in campaigning for the conservation of this priceless and influential artwork. Judy Baca, famed L.A. muralist and the founder/artistic director of the Social and Public Art Resource Center of Venice, Calif., gave an impassioned speech on the importance of the Siqueiros mural and of muralism in general. She noted L.A.’s reputation as the mural capital of the world, and implored those present to support a revitalization and expansion of the L.A. muralist movement. The artwork is now sheltered by a metal covering, over which is stretched a digital reproduction of the mural as it looked before it was censored by a coat of whitewash in 1932. The Getty’s plan is to preserve the mural just as it is — a ghost image — and not to repaint or fully restore it. Siqueiros painted his mural on concrete using Pyroxylin, a newly developed material that was primarily used to paint automobiles. Conservators have found that the paint’s adhesion to the wall was flawed, adding to the problems of restoration. Fleeing repression and persecution in Mexico, Siqueiros came to Los Angeles in 1932. During his six-month stay here, he painted three important murals before being brusquely deported by the U.S. government. His first mural was “Mitin Obrero” (Worker’s Meeting), a two-story creation painted on the side of a building at Chouinard School of Art, where he had been teaching mural painting techniques. It was the very first time anyone in the world had used an industrial spray gun to paint a mural directly on cement. 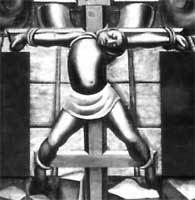 In July 1932, the mural was almost immediately painted over by right-wing authorities. Siqueiros’ second mural was “America Tropical,” and his third, “Retrato del Mexico de Hoy” (Portrait of Mexico Today), only survived because it had been painted on the wall of an outdoor patio at the private residence of film director Dudley Murphy. The fact that “America Tropical” is a more well-known and significant work indicates that its reinvigorated presence will no doubt render tremendous positive effects for the people and city of Los Angeles.